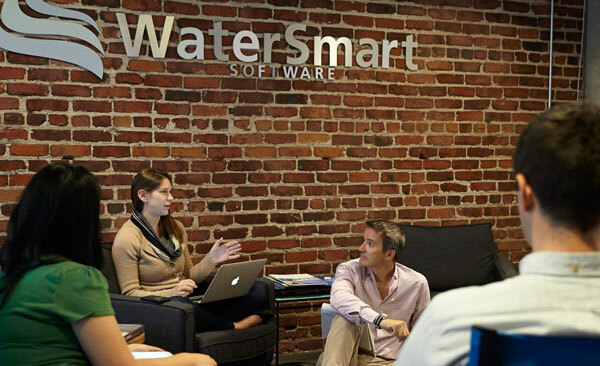 We got to speak with Deborah Sherwin who leads design at WaterSmart Software. Using data analytics and behavioral science to help water utilities and everyday people conserve water, the importance of WaterSmart’s mission is absolutely undeniable especially to use Bay Area residents who are being directly impacted by our current drought crisis. Can you tell us a little more about what you and your team are up to at WaterSmart? The big picture is that people waste a lot of water because they just don’t realize how much they use, how much they waste or how much they can save. The goal of everything we design is to communicate with customers in a more meaningful way. Information really is power here, isn’t it? Yes. We have really moved from a time where all of the talk was about the access to “big data” but now it’s about leveraging that data to design communication and experiences in a very personalized and powerful way. We’re studying our customers’ uses to understand individuals’ behavior very specifically with each data set having its own story. This brings me to how we’re thinking about design. It really has to strike a balance between both sides of the brain. Logical and relatable. Capturing the big picture and the fine details. Effective and beautiful. Scientific but still human. The balance is critical to our success. Knowing that I’ll be able to see the impact. Working so closely with data scientists and leveraging cognitive psychology, we’re really standing on the shoulders of giants. It’s so powerful to be able to measure impact though. I came from a print focused agency and we would always work to achieve our clients’ goals but often there was no way to really get measurable feedback. Success was basically based on whether or not they called us again for another project. Here, there’s just so much feedback and seeing that tangible impact is really motivating. We have an incredible spectrum of talent and expertise and it’s not just specific to design. It’s the coming together of our engineering, data scientists, and deep expertise in the water industry into design. What are you currently fascinated by? How is that feeding into your work? I have been totally fascinating by witnessing a generational shift with how people experience and react to the availability of data. Most people like to have basic information and they’re willing to allow some access in exchange, but older generations tend to feel like it has a big brother effect whereas more and more younger generations actually expect to have access and information from their data. Balancing these two perspectives is very challenging because we are designing for everyone who has a water account and our clients and partners are often municipalities who are often conservatively minded. The data we have access to today is so exciting. The stories it is telling are just so powerful. It’s no longer just a data dump. And although often times it can be so challenging to figure out what to do with it, it’s also so fun. We used to be so limited but now data can be manipulated in so many ways. Because of that we have to make sure we’re being responsible storytellers. How does San Francisco influence the work you do? It’s good and really insulating at the same time. We are definitely a part of the SF tech scene and that absolutely keeps us on our toes in a wonderful way. But we also have to check ourselves because at the end of the day, we have to build for the average person. It’s amazing to see how a place changes your experience and perspective. You can imagine the comments we receive about our product from customers in Palo Alto are drastically different that those we receive from Dallas. What are your tips for other designers out there who may just be getting started? I often see people trying to hedge their bets by trying to include too much in their portfolio in an interview. Your portfolio shouldn’t just show what you’ve done, it should support showing what you want to do. Take a stand with it and make it clear where you want to add value. Also, practice writing and not just designing. I’m in a place where I don’t have staff writers and it’s critical that I am a part of the words. It’s an arrangement and they have to work together.